Why Choose Retire-At-Home in Toronto and North York? For over 20 years we have been providing customized care to individuals who are dealing with health concerns that affect their independence. Our goal is to give our clients the choice to stay at home for as long as they wish while maintaining their independence. Mrs. Martin founded Retire-At-Home with the philosophy that quality care must address both the emotional and the physical health of an individual. It has been shown that the healing process is accelerated when a person is emotionally healthy. This is the reason we aim to bring peace of mind to our clients and their families by making every effort possible to personalize our services to each client and their individual needs. This is our total well-being approach and is the philosophy that drives our entire team to build strong, long-lasting relationships with all our clients. 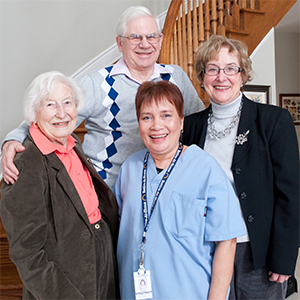 The backbone of any home health care company is the strength of their caregivers. At Retire-At-Home Services we have a stringent and methodical process to ensure our staff are the most skilled and compassionate that Toronto has to offer. Over the years, we have built trusting relationships with local colleges, non-profit societies, and associations. Through these relationships, job boards, and referrals, we start with a large pool of candidates and spend considerable time and effort narrowing the field until only the best remain. Each candidate is first screened over the phone, and then interviewed in person. Successful candidates are subject to a criminal record check and must have at least two impeccable references. We follow this up by providing each caregiver a full day orientation on providing care the “Retire-At-Home” way – to ensure the delivery of our services meet our high standards. Caregiver continuity is vital for a long-lasting and successful relationship with our clients. We ensure that our staff understand how valuable they are by providing above-average wages, training opportunities, and full schedules. Each new member of our team receives a thorough orientation, as well as a realistic job briefing when they begin working with a new client. Our caregivers are fully insured by our corporate liability insurance as well as the Workplace Safety and Insurance Board (WSIB). We are very particular about the people we hire. When evaluating a potential hire, we always ask ourselves, “would I trust this person to look after my own parents?”. We believe this is where the bar should be set, and we will never lower it.